First, a little background on the slimehead collective. Slimeheads are a group of 45 species of deep-sea fishes that form the family Trachichthyidae (which, incidentally, means “rough fish”). They form dense aggregations around rocky outcrops and other geologic structures, particularly on seamounts. 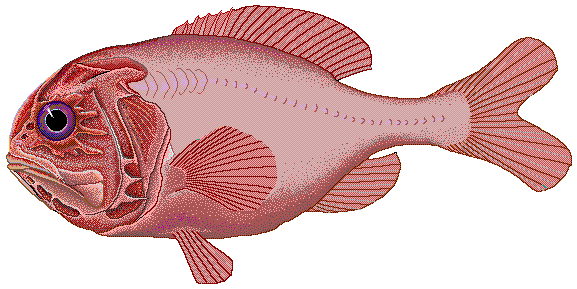 They are generally very long-lived (estimates of orange roughy lifespan reach into the hundreds of years). They hang out near the sea floor, instead of swimming up into the water column. They feed on zooplankton, such as shrimp, amphipods, krill, and fish larva. To reproduce, they form large spawning aggregations where they broadcast their gametes. Hoplostethus atlanticus, the slimehead known commercially as orange roughy, is among the largest and longest lived slimeheads. It forms dense, genetically isolated populations on seamounts throughout the Pacific and Atlantic. Like all slimeheads, they are slow growing, taking up to 30 years to reach maturity. Like all fish, slimeheads possess a lateral line, a system of sensory organs that run the length of the fish’s body and detect minute changes in pressure. The lateral line allows fish to detect nearby vibrations and movement. The slimehead lateral line also consists of a concentrated frontal array of mucus filled canals. These canals are the inspiration for the moniker slimehead. Beyond inspiring a pretty sweet name, these canals form a complex sensory system that can detect minute changes and may be able to sense low-frequency sound. This makes slimeheads very good at avoiding predators and helps explain how such a tasty fish can survive for more than 100 years and afford to put off reproduction for three decades. This advanced predator avoidance sensor may also be the slimeheads downfall. Observations of slimehead behavior suggest that, when presented with a large pressure wave, the fish swim towards the seafloor and aggregate. This is a great strategy for avoiding a large, pelagic shark, but a terrible way to escape the gaping maw of a deep-sea bottom trawl. Instead of protecting the slimehead from the world’s most efficient oceanic predator, this defense mechanism increases the number of fish that will be caught in each trawl. Harvesting long lived, slow reproducing fish is always a bad idea, since reproductive output can’t keep pace with mortality. For slimeheads, which aggregate in distinct, genetically isolated populations, this mean that they have exceptionally low resilience to massive disturbance. Add to that a predator avoidance behavior that increases the catch rate, and you have a recipe for total fisheries collapse. While there is sustainable seafood out there, slimeheads will most likely never be one of them, no matter what you decide to call them. *you may be more familiar with the market names: mahi-mahi, Chilean sea bass, monkfish, crawfish, king mackerel, and whitefish. The hake is a lie. My a-Pollock-gies. There’s a time and a plaice for these things. I didn’t mean to earn your wrasse. Mahi mahi is dolphin? Before I ponder whether I have moral compunctions about eating dolphin, how sustainable is it to fish for them? Coryphaena hippurus, also known as dolphin, is a fish, not to be confused with the less charismatic marine mammal. They were rebranded as mahi-mahi because people were seeing “dolphin” on the menu and thinking “flipper”, not super-tasty perciform. Dolphin fish are actually one of the most sustainable fisheries. They are fast growing, reproduce quickly, and because they don’t school, are caught almost exclusively on handlines, or occasionally as bycatch.